Would you like to sleep really well? Would you like to stop your mind racing and feel calm? Would you like to stop the disruption of waking in the night? Would you like to know what to do if you wake up in the night? Would you like to be able to sleep when you want to? Would you like to awaken full of energy? Then this is the book for you! We spend nearly a third of our lives sleeping. However, more people are suffering from insomnia than ever before. 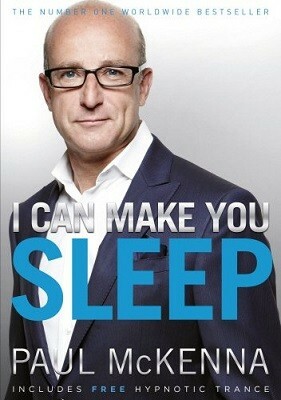 Paul Mckenna has made a remarkable 20 year study of tackling insomnia.He has developed a unique, easy system that everyone can use to improve the quality of their sleep. In this book he shows you how easy exercise and simple changes in your thinking and behaviour can have a significant impact on your sleep. This book also comes with a hypnosis download that re-sets your body's natural sleep mechanism so that you will automatically find it easier to get deep restful sleep and have energy to achieve what you want and improve your overall of quality of your life. Paul McKenna is a hypnotherapist and an internationally best-selling author whose books have sold more than seven million copies and been translated into 32 languages. His works include: I Can Make You Thin, I Can Make You Sleep, Change Your Life in Seven Days, Get Control of Sugar, Quit Smoking Today Without Gaining Weight and I Can Make You Happy. Found this very informative, play the CD every night and over the few weeks I have had this, I have had only 2 bad nights. Dont know how I have managed without it ! Excellent and I have recommended it to others.